« It’s raining olives now–after the storm. Keith is driving the white van loaded with red and yellow crates brimming with the last two days olive harvest. We’re bunched in beside him–Meredith finishing off her oat flake breakfast as the sun begins to warm the hillside vines and olive groves. It is 8.30 in the morning, at the start of a long day. Through the windows of the van as it negotiates the holes in the unmade-up road–the central Tuscan hills come into historic perspective. What’s that tower up there? 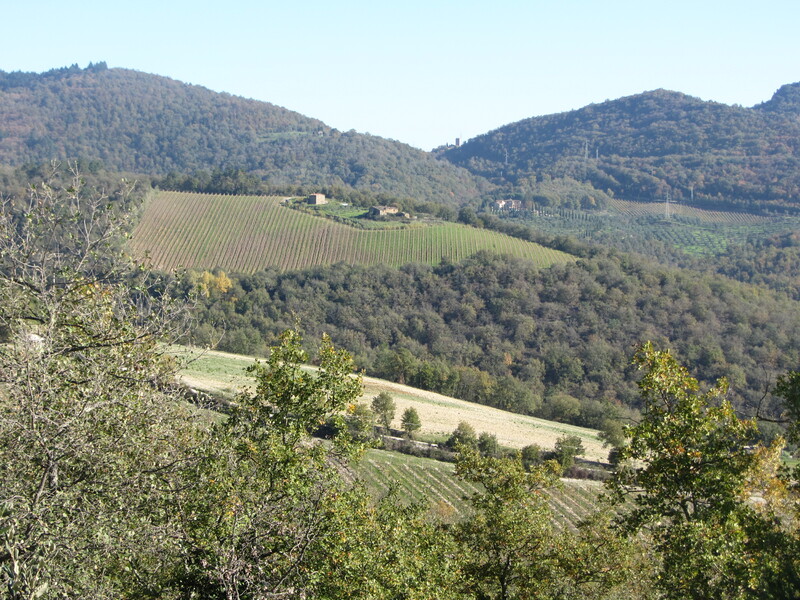 Tuscan hills with the tower in the dip between. The hills are smirking in the shade–they’ve been here a lot longer. By nine we are at the Frantoio. 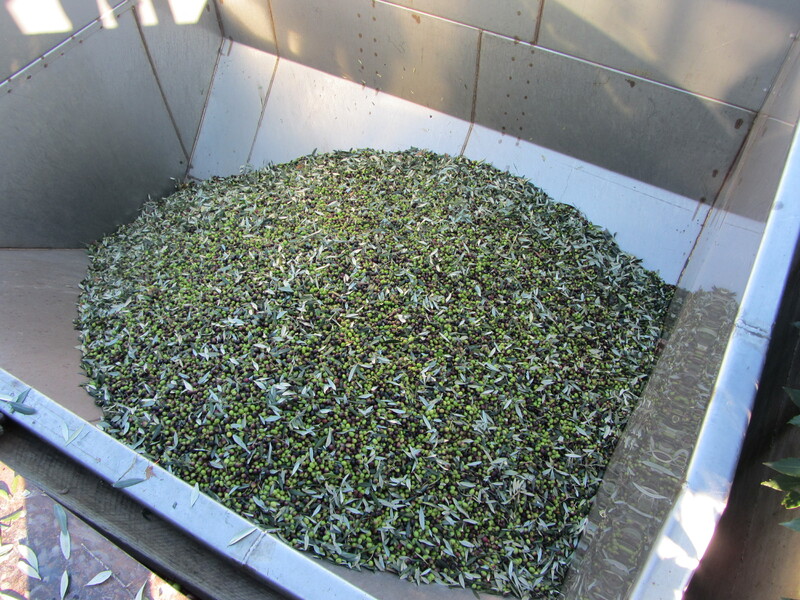 By 9:15am the olives have been emptied into the steel shute and are in the system, soon to come out as liquid gold–as we thought. We wait in the sunny waiting room, reading. After half-an-hour Keith comes in looking daggers. There’s a fault in the heating mechanism–they don’t know how long it’ll take. This is a problem for us–we have to be in Florence by lunchtime. 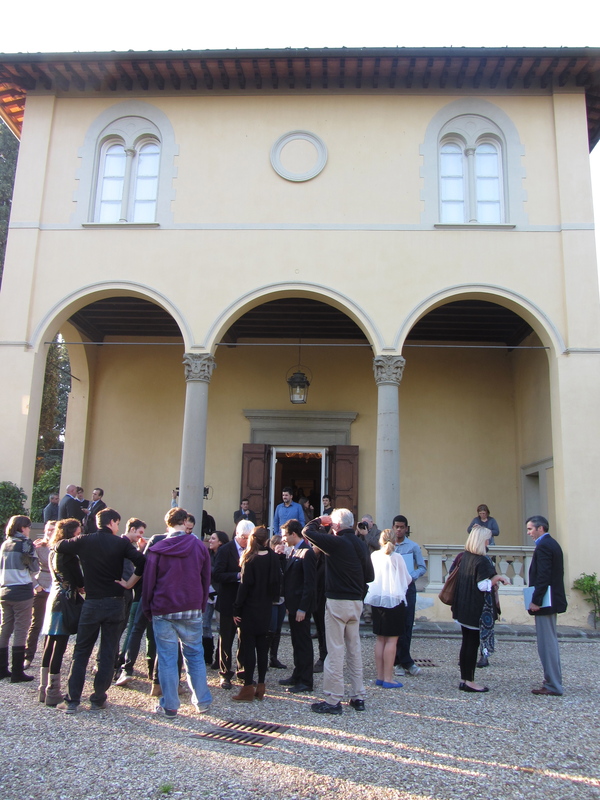 Meredith spotted a conference being held over the weekend at the New York University Florence campus analyzing the recent American elections. I’ll take you back home and check train times. Keith, keeping his good temper but worried about his olive oil, ferries us back through the sunny hills. Within an hour we are on a train to Florence. Soon after we manage a quick lunch (research!) before heading to the event. 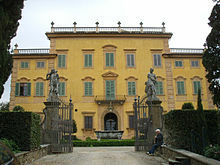 The conference is being held at the magnificent Villa Pietra up in the hills north of Florence. Pollsters, pundits and campaign managers from both sides sit on panels and talk amicably about what happened on November 6th, why and how the parties will adjust to the result. (One afternoon’s talking shop does for me and I’m able to watch the following morning from the comfort of the hotel room as it’s streamed live over the internet. Late afternoon, now, we make our way back into Florence and catch our first sight of the Duomo this trip. It sits benign and vast in the centre of the city as the evening lights come on round it. We check into our hotel down by the river and think about dinner! La Sostanza is a short walk away and they have room at 7.30. 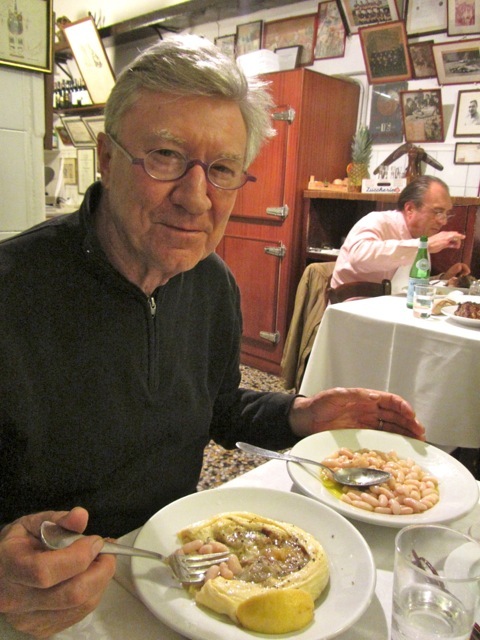 Tortino carciofi (artichoke omelette) and fagioli e olio (beans and oil) and a happy punter! I discovered this modest restaurant by chance in 1977 and have been a regular ever since. It serves simple fare at communal tables in an unassuming room. The cooking is done on a wood fire in a kitchen the size of a postage stamp. Same photos and paintings on the walls–and two of the waiters are sons of ones I met on my first visit! 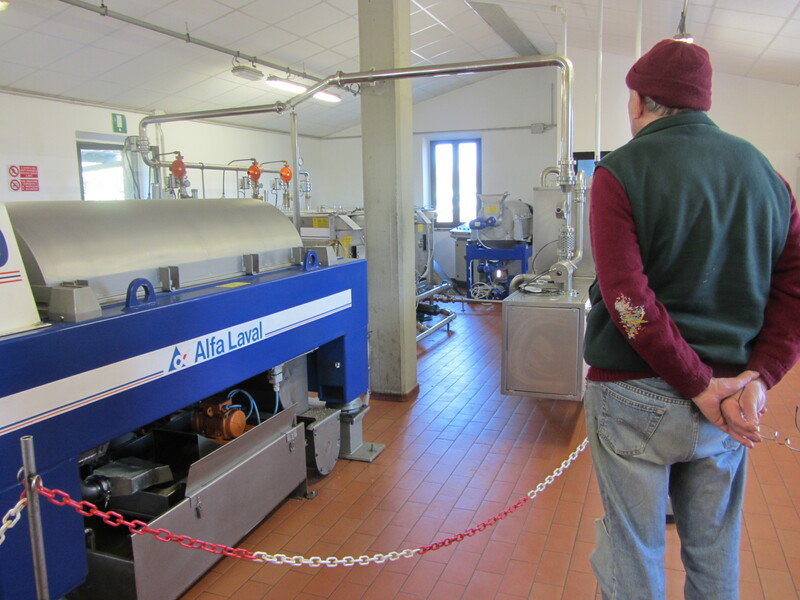 was fixed quicker than expected and no harm done to the olives already being processed. End of a day and a half and back to the hotel and a final photo op. Closest I’ll get now! RIP Marilyn. What a day! I’m exhausted just reading about all you have done! 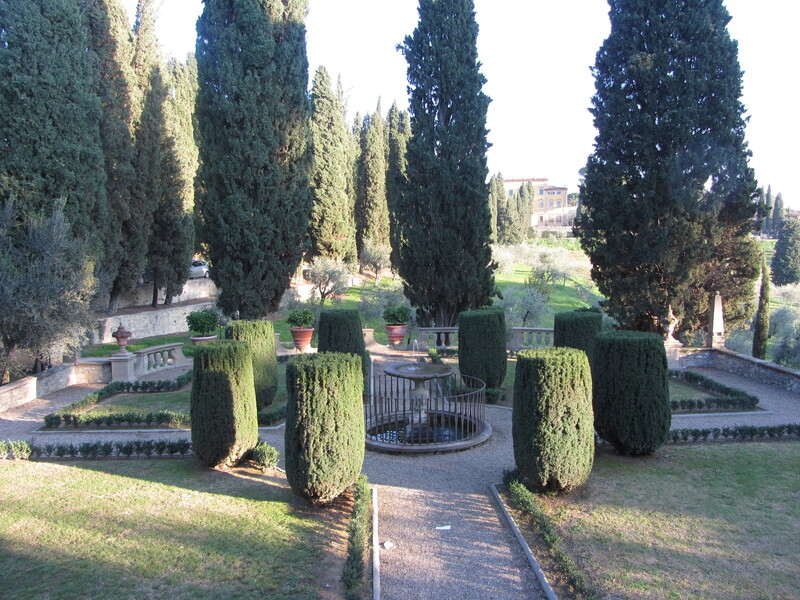 Enjoy the beauties of Florence. What a fantastic place, wonderful food and art. Robin and Meridith…thanking you for sharing this…life goes on in so many different ways all around the world. On another note I can relate to Meridiths interest in politics…I have it too. Hi Robin, love reading your journal and looking at the lovely photos. So you and Meredith were helping to bring in the harvest – very ‘Ross and Demelza’! It’s so much fun to be able to share and very good of you to do the hard work! Thanks, Linda–it’s fun and hard work! on November 18, 2012 at 12:30 pm | Reply Dianne P.
Lovely trip. Great restaurant. 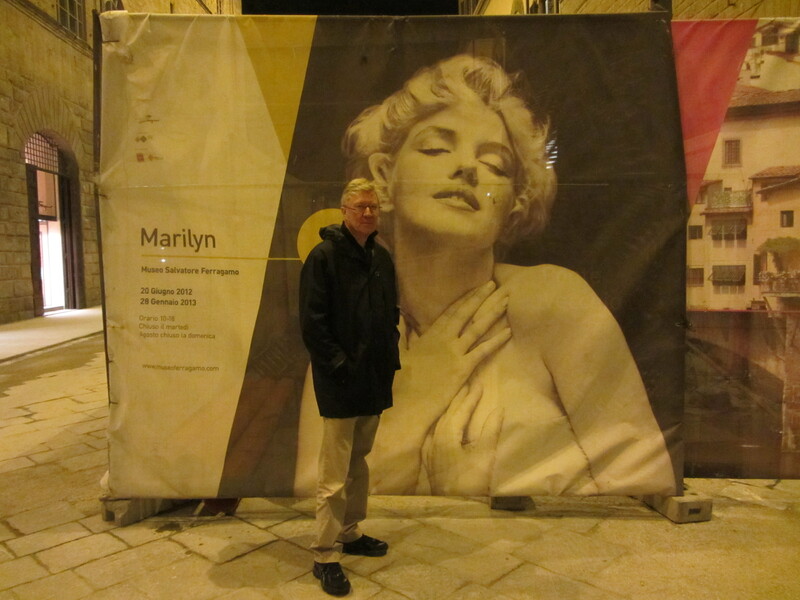 Met Marilyn Monroe way back when. I am telling my age. Beautiful memory. “…both sides…talk amicably about what happened on November 6th,” – You MUST be in Europe. Sad to say this is not generally the case here. Would have done anything to hear Meredith – I am positive her comments were well thought out, polite and RIGHT ON. Thank you for your vivid description of your adventures. Until I am able to travel for real, I travel the world vicariously through your words. Safe journey to you both! It’s a dark,grey day here in England so I enjoyed reading your descriptions of Italy. You have a good way of writing. Hi Robin and Meredith! Lovely interesting piece and great photos as always. 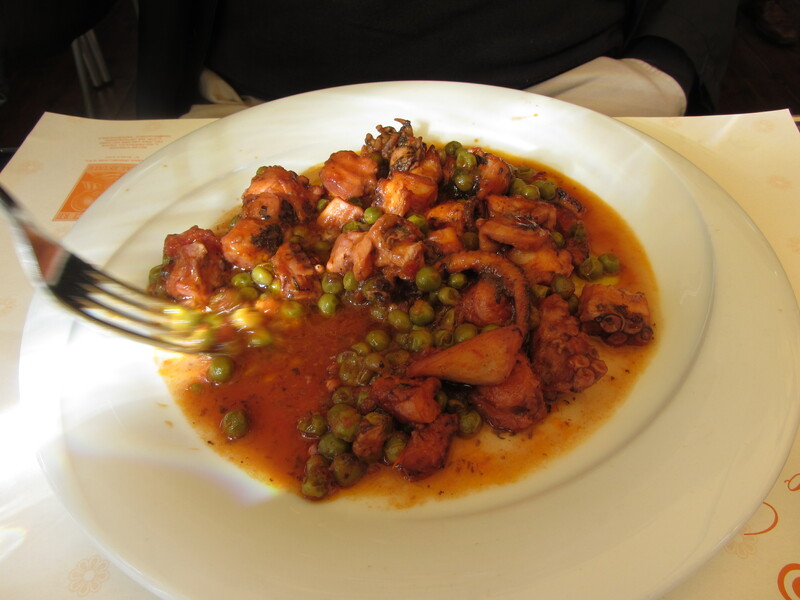 What a lovely travel log – Could almost taste the food and feel the sun! Sounds like you had a great time. Hope Meredith enjoyed the conference, the location certainly looked wonderful. Thank you, Trisha–I look forward to the expresso!